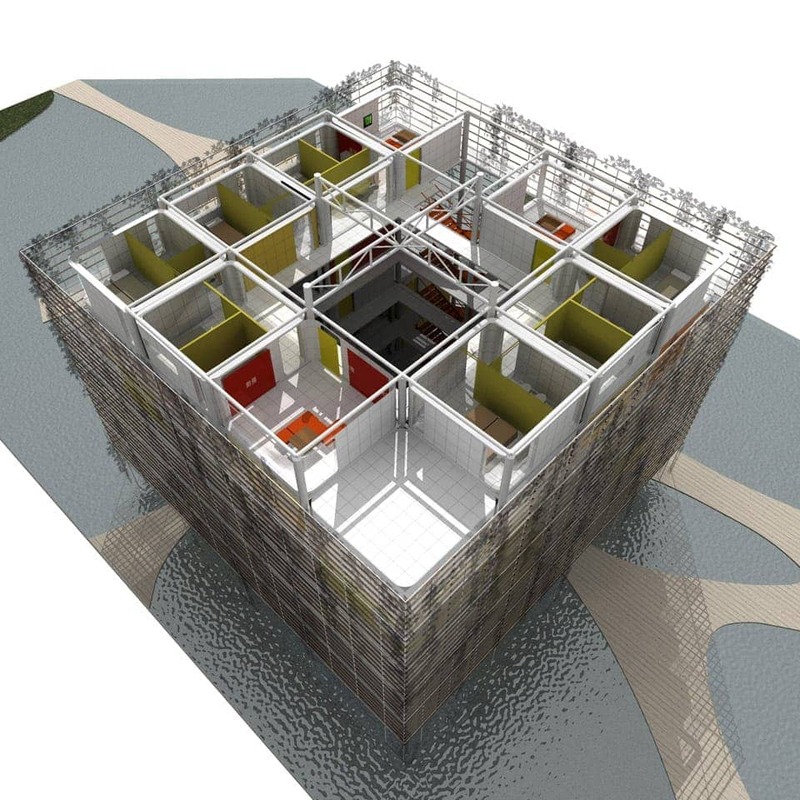 The “Lilies” project is divided into 3 independent blocks, located in the middle of a water basin; the acronym LILIES comes from that: like water lilies, the buildings grow on water and use the Sun radiation to fulfill their energetic needs. The electric power is produced by an array of 9 solar Stirling motors, a type of solar generator that utilizes the difference of temperature to generate electricity. 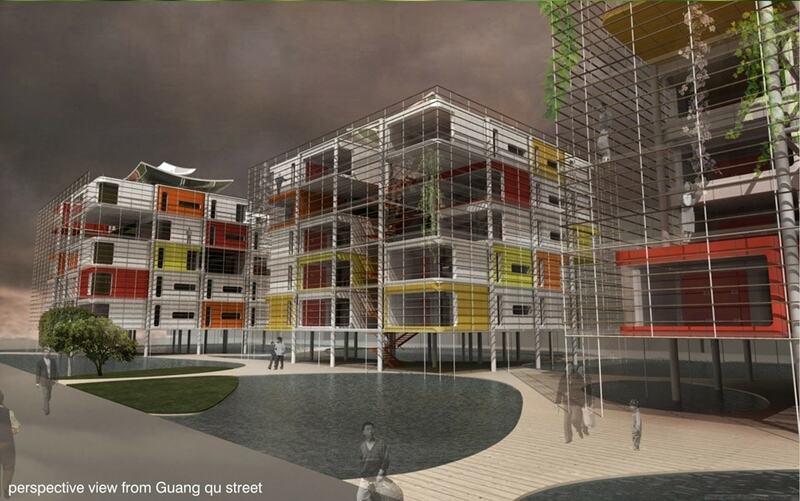 The heating/cooling system is based on a water heat pump that exploits the water basin at the base of the buildings. Natural ventilation is also widely implemented, especially in Summer. All the energy required by the buildings and their inhabitants is produced on site. 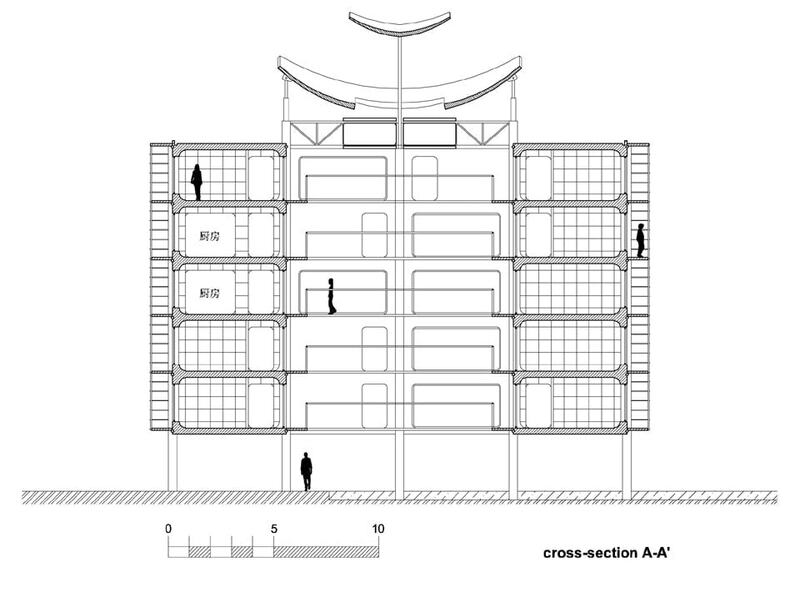 The apartments inside are made by modular units attached to a steel structure. By aggregating such unit,s it is possible to obtain within one block a diverse set of apartments, all with an outdoor terrace. The total gross surface is of 7,200 square meters, while the surface of single apartments ranges from 38 to 100 square meters. All dwellings are based on a 0,6×0,6m module/tile; the standard tile includes a low-voltage wiring with power and signal sockets and 4 led lights. Therefore, every point in the space could be transformed into a light fixture, a support for TV’s, or into other kinds of electrical equipment. The tiles are also provided with a soft rubber cover, allowing people to sit on them. 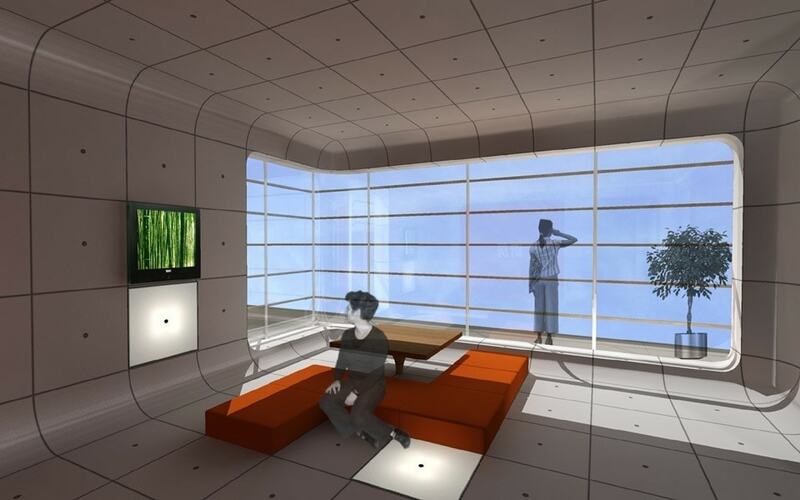 The concept is to eliminate the traditional subdivision of a room in predetermined functional zones: every part of the room can be freely configured and adapted as their inhabitants would like. The external cladding of the building is made with modular aluminium tiles, the interior spaces are coated in a translucent polymeric elastomer. 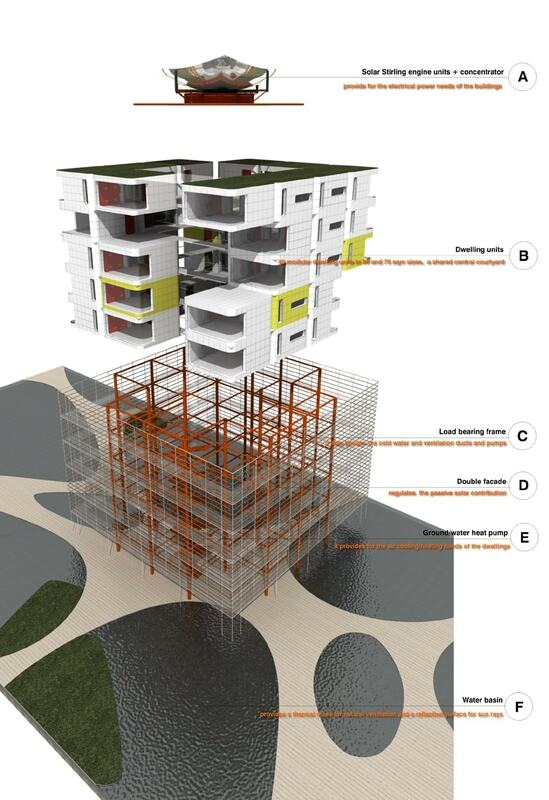 A 180 mm thick cellulose fiber thermal and acoustic insulation is placed between the external and the internal layers. The load bearing structure is made in galvanized carbon steel. 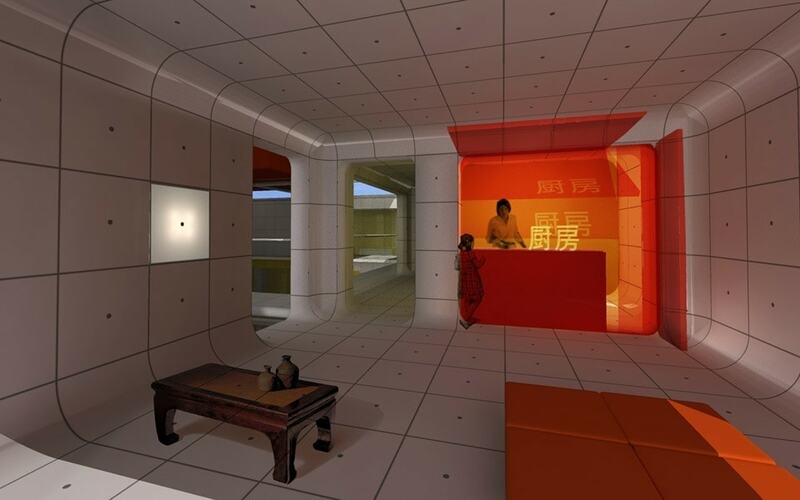 The building development is located at Chao Yang district, Beijing. Site area is 3887.5 m2, near city artery and branch road. Latitude 39°48 and longitude 116°28 Measured point has 32 meters height above sea level. The typical Beijing climate conditions range from cold winters to hot, humid summers. Each block is equipped with eight Solar Stirling engine units manufactured by SOLO Stirling GMBH which provide up to 8×8 KWP on Beijing average conditions. Stirling engines are based on temperature difference into a the hot chamber, heated by solar radiation via a tracking parabolic concentrator, and a the cold chamber cooled by the water from the underlying water basin. – possibility of integration with conventional systems (i.e. methane gas burners). The facades allow sunlight be transmitted into the dwellings, an additional contribution comes from sunlight reflection by water. The courtyard’s top is covered so to trap the heat passing through staircases and other openings on the facades. The main heating source is provided by ground heat pumps, fully powered by a series of Stirling engine units, thus reducing the net CO2 production to zero. The balconies avoid direct sunlight to enter into the dwellings, climbing plants on the facades act as additional sun-shading system. Natural ventilation is incremented by exploiting the depression effect produced by the wing shaped “concentrator” over the courtyards; the thermal mass of the water basin also contributes to the cooling effect. The courtyard in the middle of each building works as a ventilation chimney, expoliting the differential density between the hot air on building top and the colder one near the water basin, thus creating an ascending flow which naturally extracts exhaust and overheated air from the dwellings. 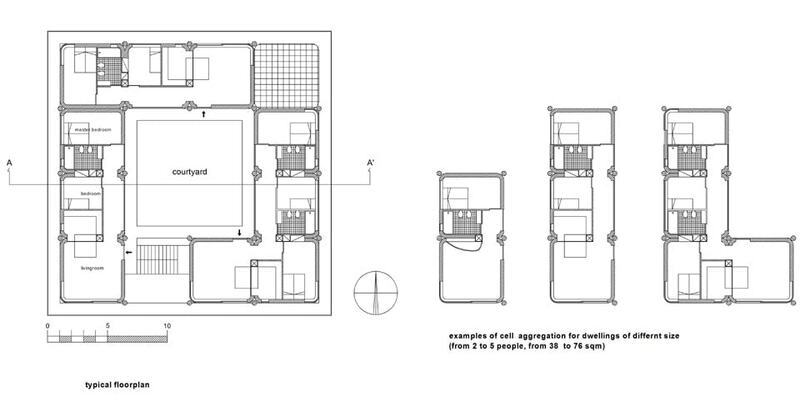 Usable area of dwellings: from 37 up to 76 sqm.